Spring is springing! At least for a few days! The robins have invaded our yard in earnest and the temps have been above freezing for a few days. That will probably change of course. It’s the Midwest you know! 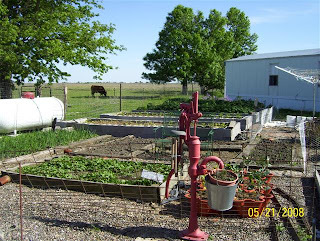 Grampa has been busy planting lettuce, onions, kale, spinach, peas and radishes. 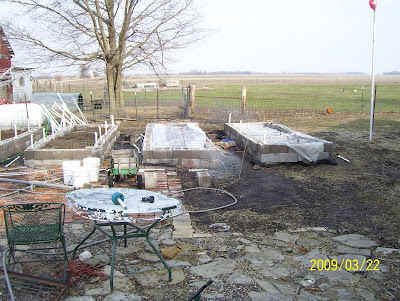 Our gardens are set up so we can put a green house over each one, but we are missing the tubing we need to do this so we just put plastic on the soil for now. 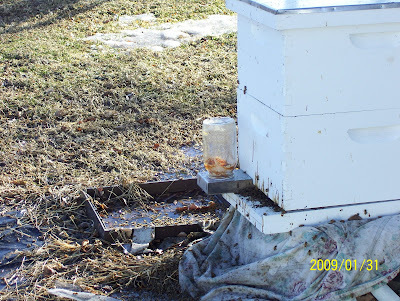 Our biggest problem is keeping the chickens from scratching up all the seed. 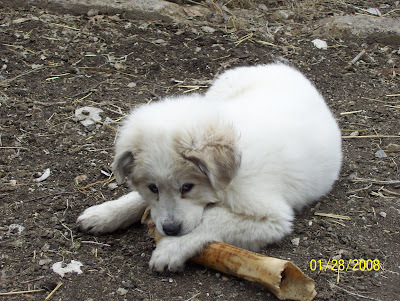 They love to scratch around in the loose dirt and find all the goodies we don’t want them to find. 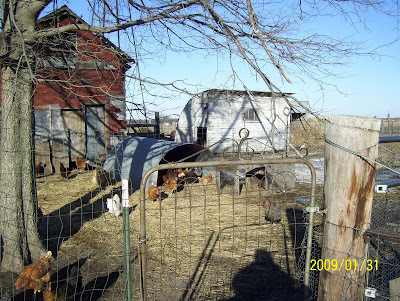 We are trying to figure out how to fence the gardens in this year since we haven’t had much luck fencing the chickens in the pasture. So … guinea fowl anyone? Grampa says he will sell them at the Burlington Pigeon Swap if we’ve still got them by then. 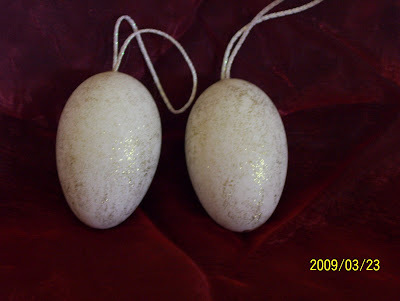 I have nearly 50 hand-blown goose eggs ready to decorate and available for Easter. 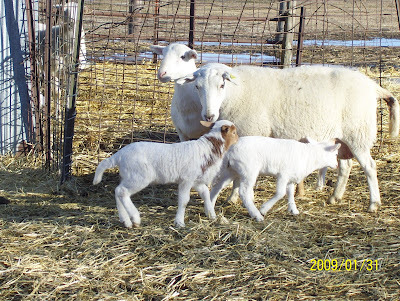 We have been getting 2 ever other day so I will have a few more by Easter. They have just one small hole on the large end. There are several simple crafts you can do with your kids that are really pretty. 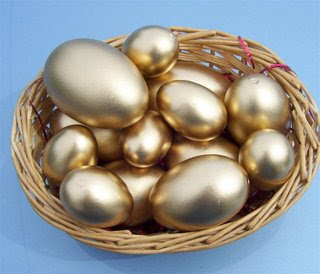 Of course you’ve seen my golden goose eggs – very simple, just spray paint them gold and put them in a basket! 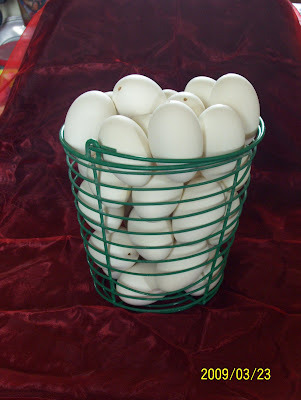 I have golden goose eggs and smaller “nest eggs” in this basket. Last night I used a glue gun to attach some sparkly cording to these eggs and then spray painted them with glitter spray. I’ve also rolled eggs in glue and then in glitter for a stronger sparkle effect. I’ve got some chicken eggs that I’ve blown too. Here’s a picture of them with a goose egg. 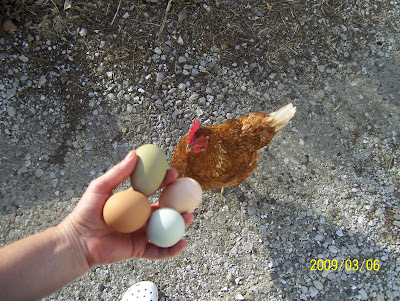 I don’t have to many chicken eggs blown and on hand, but it wouldn’t take long to get a batch together! Thought I’d take the biggest and the littlest chicken egg in this picture and put them beside a tape measure so you can get an idea of their sizes. 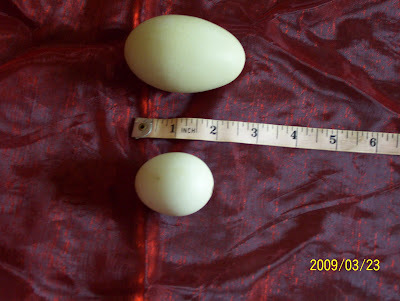 The little one is a pullet egg ( from a hen that has just started laying). We should be getting lots of these in browns, blues and greens soon. The large one was a double yolker. They are fairly rare. 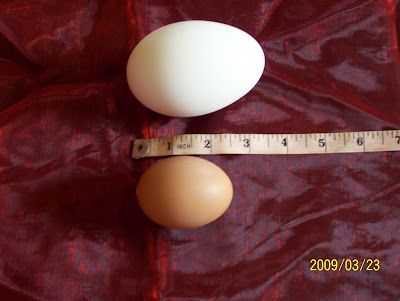 This next picture is of a typical sized chicken egg next to a goose egg. 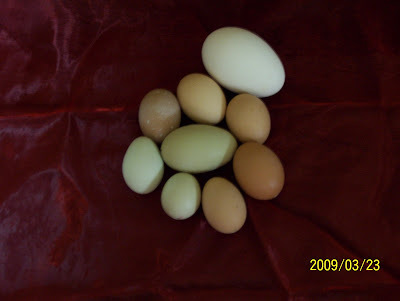 Goose eggs are not only bigger than chicken eggs, they are also much thicker. They still break, but not as easily. This makes them easier to work with for crafts. If you are interested they are 75 cents each plus shipping. Call or e-mail to order. I’m taking a goose egg pie to a sick friend this afternoon. Whip eggs and milk until well mixed. Add all remaining ingredients except 1/2 cup cheese. Pour into oiled pie plate. Refrigerate for at least 24 hours. Then cook at 350 degrees for 30 minutes or until firm. Add the remaining 1/2 cup cheese to the top about 5 minutes before it is done. This recipe freezes well. Just put the uncooked mixture on a level place in the freezer. Then thaw in refrigerator before cooking. Spring is teasing us! We have a few days of warm temps then we plunge back down! 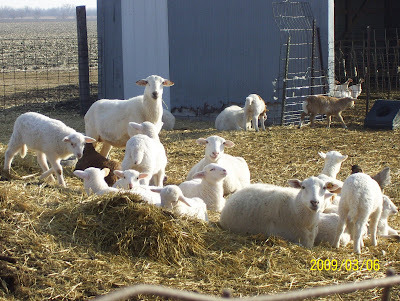 All the sheep but 3 have lambed. We have 24 little ones so far! 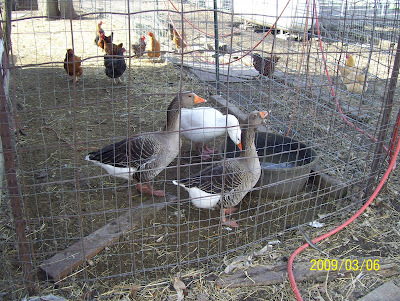 The geese are loving this weather and giving us eggs. I have a supply of blown goose eggs if anyone is interested! $0.75 each plus shipping. 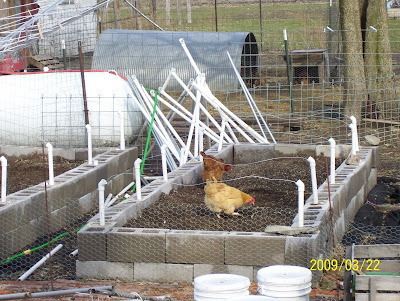 Our chickens have gone off strike status. We are getting around 20 dozen a week now. 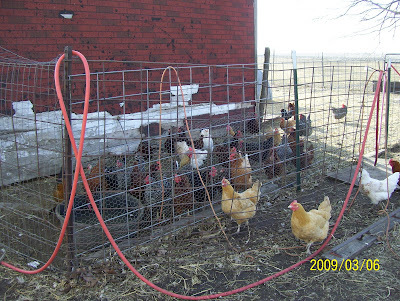 We are also getting a few pullet eggs from the chicks we bought last fall. By next month we should have 40 to 50 dozen a week. Still not enough to fill the orders we have, but getting closer. We have ordered another 150 chicks, but it will be late October before they start laying. 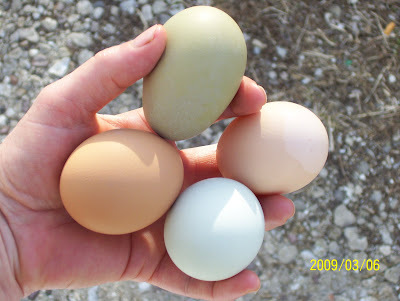 I wanted to show you all some of the variety we have in egg colors. When I took them outside so I could get a good picture this little hen was very interested! 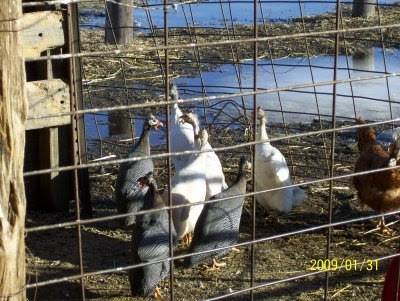 I bred some blue roosters to my brown egg layers last year. I am so pleased with the khaki color that resulted! It is fitting for a mom that has 2 kids who are full time military! If you look carefully, the egg on the upper right is two toned. We’ve been getting one like this almost every day. I have updated my Beyond the Paycheck intro on the right side of the blog website. The first two paragraphs are the same, but I changed the end. If you get this by e-mail and would like to check it out you’ll have to go to the website. I’m thinking I probably ought to do this monthly during the winter. Come summer though, I hope to have at least a menu of what we available on a weekly basis so local folks can order home delivery.